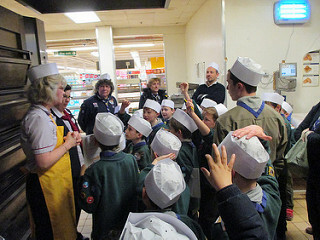 Our visit was centred round a ‘Farm to Fork Trail’ where the Cubs learnt about how their food is grown or produced and also went behind the scenes in some of the departments at the store and engaged in some food tasting and other activities. The visit lasted 2½ hours and the Cubs had a Workbook to complete, but nothing too onerous, with the answers being based on what they were told or saw. During the course of the visit, the Cubs were able to taste various foods including different cheeses with various strengths and tastes, bread and vegetables and also handle different fish as well as seeing how a fish was gutted. They visited the Bakery and were shown the machinery, ovens etc and told what was baked there. The highlight of visiting the Bakery was being given a jam doughnut each to take home! There was also a visit to the warehouse, cold store and the freezer. Certainly none of us would have wanted to get shut in the freezer. Brrrrr! All the Cubs completed their Workbooks and were presented with their ‘Farm to Fork Trail’ Activity Badge which was sponsored by Tesco. A big thank you to the team at Tesco who made our visit such an interesting and fun visit with the Cubs being able to learn a lot and have the opportunity to ask lots of questions.